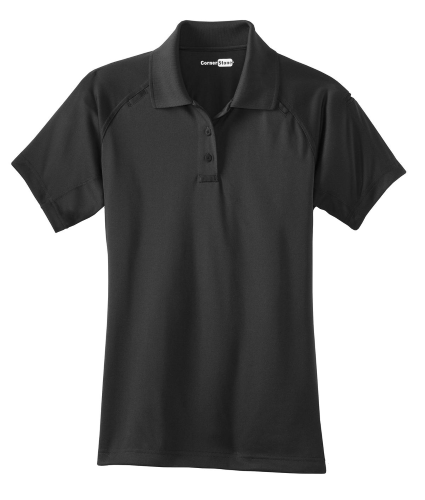 With strategically placed mic clips and dual pen pockets, our tactical polo is designed for event staff, security and law enforcement. Built for performance, this snag-proof, moisture-wicking, odor fighting shirt will keep you sharp and professional looking on or off the job. | 6.6-ounce, 100% snag-proof polyester Rental friendly Traditional, relaxed look Double-needle stitching throughout Tag-free label Flat knit collar 3-button placket with dyed-to-match buttons Mic clips at center placket and shoulders Raglan sleeves Reinforced dual pen pockets on left sleeve Side vents * Due to the nature of 100% polyester performance fabrics, special care must be taken throughout the screen printing process.